KCB Bank commits Kshs 50 billion for Youth Entrepreneurship – Kenyatta University TV (KUTV). All Rights Reserved. KCB Bank Kenya has announced a Kshs 50 billion commitment towards boosting youth entrepreneurship, offering fresh opportunities to thousands of budding entrepreneurs. Through KCB social investment arm, KCB Foundation, the lender will use the funds to support entrepreneurs under its youth enterprise flagship programme 2jiajiri. Entrepreneurs will have an opportunity to access funding at single digit interest rates under the programme. The programme aims to support young entrepreneurs to gain access to finance, enabling them to become self-employed and create employment for other young people countrywide. In 2018, the KCB disbursed a total of Kshs.18.3 billion in funding local SMEs, Additionally, KCB has advanced a total of Kshs. 4.4 billion to 17,146 Micro SMEs to finance their growth, while another 10,519 SME customers have accessed Kshs.13.9 billion in loans. “The fact is, our young people are ambitious, driven and have proven to us over and over that they have the ability to transform this country, if only they are given a chance. 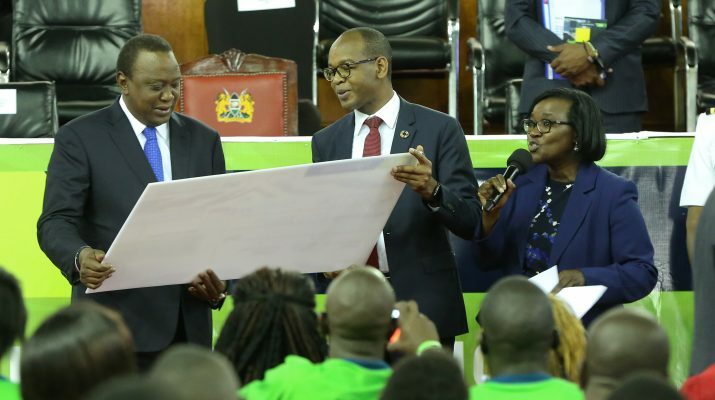 The purpose of the funding is for startup and working capital for beneficiaries under the programme,” said KCB Group CEO and MD Joshua Oigara. KCB launched 2jiajiri in 2016, a programme that seeks to formalize the informal sector and skill for self-employment targeting the youth and small businesses. It focuses on growing youth micro-businesses in the informal sector and bring them to a place where they can employ at least 5 other young people with an aim of creating 250,000 jobs in five years. So far, KCB has skilled 23, 059 (47% female – 10, 893) and 53% male – 12,166) youth beneficiaries on technical skills and financial literacy across the country in the five sectors– Construction (4,459), Automotive Services (1,383), Domestic Services (1,145), Beauty & Personal Care (2,119) and Agriculture (13,953). “We are committed to scaling up the investment to build small enterprises as they offer the greatest potential to self-employment. They will now be able to access financing which will allow them to grow and therefore absorb the skilled workforce,” Mr. Oigara said while speaking at a graduation ceremony for 10,000 2jiajiri graduates held at the Nairobi on Thursday and attended by President Uhuru Kenyatta. 2jiajiri has a 3-step approach: One: Inception; vocational skills training is provided in the areas of Construction, Automotive Engineering, Beauty, Domestic Services and Agribusiness; Two: Incubation; in this step, programme participants receive financial support as well as business development services (BDS) for their existing or new businesses for a period of 12 months. BDS is deployed through a 3-member consultancy team drawn from a pool of university graduates from leading local universities to offer legal, marketing and financial management support to the start-up businesses; Three: Maturity; this is stage where the start-ups having become bankable are facilitated to secure business services from a financial institution. KCB Foundation has been working with a series of partners to scale up 2jiajiri. The Foundation, in partnership with GIZ E4D/SOGA (Employment and Skills for Eastern Africa) programme is implementing a project aimed at increasing employability and income generation for 4,000 youth in the informal agribusiness and construction sectors in Kenya. The project duration is from July 2017 to November 2019 at a total budget of US$ 2.7 million. The Foundation is also working with USAID-funded Research Triangle Institute (RTI International) to implement the Kenya Youth Employment and Skills Programme (KYES) for 5,000 youth beneficiaries within 9 counties (Kisii, Kericho, Bungoma, Migori, West Pokot, Kwale, Nyeri, Garissa and Nairobi). The project objective is to improve income and employment opportunities.